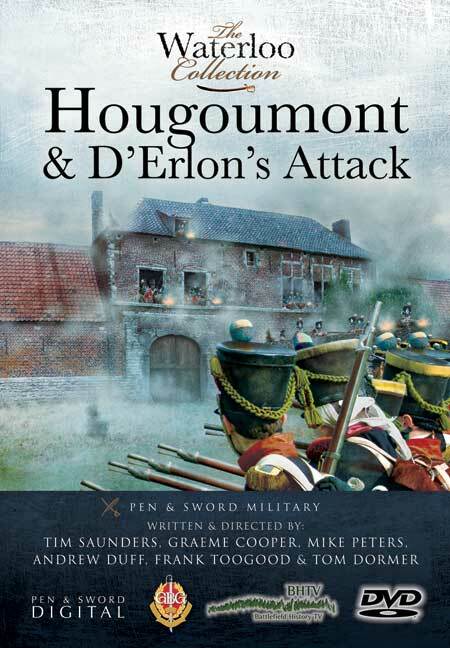 You'll be £15.99 closer to your next £10.00 credit when you purchase Hougoumont and D'Erlon's Attack. What's this? Following on from Ligny and Quatre Bras, Part II starts by focusing on the concentration of the Allies on the ridge of Mont St Jean and the plans of the opposing armies. While the guns of the Grand Battery thundered in the centre, French columns bore down on the Hougoumont chateau and farm complex, which protected Wellington's flank held by the Guards and their German allies. Thus began an epic 'battle within a battle' that sucked away valuable troops from Napoleon's main attack, causing Wellington to declare that 'the battle turned on the closing of the gates at Hougoumont'. Meanwhile, with drums beating and Eagles to the fore, D'Erlons Corps attempted to bludgeon its way through Wellington's centre, not knowing that the British and Dutch line was in waiting on the reverse slope. Upon seeing the French advance, the British released a disciplined volley of musket fire that checked the French. A further brilliantly timed charge by the Household and Union Cavalry Brigades finally saw the French off. Analysed in detail using the latest historical sources, the team provide a fresh slant on this phase of the battle. The film was shot on location on the very field of Waterloo where the terrible events of this most iconic of battles took place. Brought to life with re-enactment on the battlefield by the regiments of the Napoleonic Society and leading authorities on the battle, Hougoumont & D'Erlon's Attack is a must for any student of warfare. At the writing of this review, I had not seen Parts III and IV. At first I was skeptical when I received the DVDs. I wasn’t sure that I wanted to spend my time watching a DVD on something that I had read many books about. I decided to give it a shot and was pleasantly surprised by their quality and depth. The narrators were engaging and had a good grasp of the subject. Several things stood out that makes the Waterloo Collection worth the money. - The narrators take the viewer step-by-step through the whole campaign. It begins with an overview of the political and strategic situation and what Napoleon was trying to accomplish. Each day of the campaign is discussed in detail, including where the various armies and their units were located at that time. - The perspective and actions of all participants (French, British, Prussian, Nassau, Dutch, etc.) are shown. - Whenever possible, re-enactors were used to provide period color and to illustrate the points the narrators were making. There is nothing like watching history come to life and what better way than in the comfort of your own home. This DVD is the second in the Waterloo Series following on from the first covering Ligny and Quatre Bras, this is does very smoothly allowing the viewer to follow the battle perfectly. This is a new way to show history for me and it does make a nice change from my normal books. I thoroughly enjoyed this and have no hesitation in recommending this DVD and I for one will be looking at getting the others to complete the series. Pen and Sword call this collection an ‘explosive four part series; and I really do think this sums it up in a nutshell. I enjoyed the first part of the serried but the second outdoes the first without question. The re-enactments are extremely well produced, useful and accurate; as they created by the regiments of the Napoleonic Society and leading historians of the battle. One also needs reminding of the immensity of the battle and to the view the locations with historians and guides discussing the facts, not ‘teaching’ or ‘preaching’, an absolute bonus! So in my opinion this is anther ‘hit’ for Pen and Sword. Much to my regret I’ve never managed to visit the battlefield at Waterloo – the closest I have got was a realisation at Brussels main station that we didn’t have enough time to get to Waterloo, have a good look, and get back again in time for the Eurostar. But in lieu of a visit in the past 10 years, this DVD, and the others in the Waterloo series, are easily the next best thing. I’m somebody who has devoured everything about the battle of Waterloo that I could lay my hands on – down to playing with little cut out squares of paper, each representing a unit, when I was but a wee lad. Not to mention being ever so slightly obsessed with Sharpe.But even I learnt something from this programme – in particular, the amount of depth given to the attack on Hougoumont was fascinating. I also enjoyed the little ‘diversions’ from the battle, to explain aspects such as the British heavy cavalry sabre, or the French Artillery system. What I really like about this programme, is that you actually feel that you are there. You are given a very good feel for the lie of the land – what Montgomery would have called ‘smelling the battlefield’. That’s one thing that is very hard to put across without actually being there, so to convey that sense by DVD is a great achievement. The height of Hougoumont’s walls, the steepness and proximity of the French and Allied ridges, and the feel of the cropfields. There are some great graphics in this as well, perfectly illustrating the conduct of the battle, and some pretty interesting scenes of living history enthusiasts on the battlefield itself. Using experienced battlefield guides at experts makes complete sense – the experience in showing visitors round the battlefield shows. In fact, the programme feels very much like a virtual battlefield tour, from the comfort of your own armchair. I enjoyed it immensely. If all the DVDs in the Waterloo Collection come up to this standard, they will form a very valuable source of information on a battle that changed the course of European history and allowed the British dash to Empire that directly affected more than 50% of the world and indirectly affected virtually all the remainder. The shooting of the film on the battlefield and the involvement of the Napoleonic Societies re-enactment enthusiasts really bring the battle to life, with the discussions between presenters fitting naturally into the presentation with a refreshing informality that draws the viewer into the discussion. An excellent DVD at a very affordable price and a worthy companion to the books that detail the Napoleonic Wars.